England / Asia: Jill Robinson: to the Moon and Back DVD – The Story of the Founder of Animals Asia. 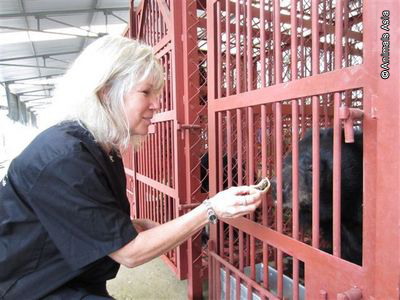 Now you can watch the extraordinary story of our founder Jill Robinson who took on the bear bile industry and created massive social and political change in China and Vietnam. ‘Jill Robinson: to the Moon and Back’ is proof that one person can change the world. Narrated by actor Peter Egan, this is Jill’s journey told from her own perspective. Our thanks to filmmaker Andrew Telling and Orange Planet Pictures for this deeply moving film. 30% of sales go to Animals Asia. Available in English only. Running time: 53 minutes. A little more about Jill – the girl from England who visited a bile farm; saw the suffering bears, and decided to start doing something about their suffering. Founding Animals Asia – they have now rescued hundreds of animals and are gradually closing the bile farms down. I had the great pleasure of corresponding with Jill just about a year ago when I asked her if it would be possible to establish an AA facility in Serbia relating to stray dog education and also a direct link with the EU Enlargement Commission. AA also does work in relation to stray dogs as well as bile bears. We threw some ideas around, but unfortunately decided against it, mainly because a lot of the (AA) funding is desperately needed primarily for campaigns in the far East such as stray animal management, running ex bile bear shelters and doing rescue missions. The other overriding fact was that despite our and many other groups attempts over many years, the brain dead Serbian government cannot get a grip on the fact that a national sterilisation programme of strays works for the very good over a period of time; gradually reducing stray animal numbers. They cannot (or most probably do not want to) grasp this approach; thinking instead that continual round up and continual killing of strays is the only answer to what they call ‘a problem’. We call it ‘corruption’ as it is a continual way of making money from the government (aka the EU) by continually allowing in sterilised strays to breed; then rounding them up as problem strays and finally killing them, whilst at the same time declaring to the public that they are providing a ‘service’ to them by keeping down stray numbers. Sterilisation is the only real way to reduce numbers ! If the money (in some cases 500 Euros per dog caught and killed – when the average monthly wage for a person is 300 Euros) was put into a national stray sterilisation plan; then stray numbers would automatically decrease over time, thus eliminating the need for shinters and money being paid out for each round up and killing. But to some in certain areas of Serbian government and regional authority, the current process is a continual way of making a fast buck (as we give figure for above) and possibly pocketing some of the big money paid out for every stray dog caught and killed. A Non sterilisation attitude such as theirs is a guaranteed way of ensuring that you always have a supply of dogs to capture and kill – and getting money from organisations such as the EU for doing it. We have given our information so many times to the EU Enlargement Commission over the years; but they are not really interested in the evidence, just the same as they are not interested in real evidence for real abuses in the live animal transport scheme for example. So we don’t win, the animals certainly don’t win, but the authorities and people in government, sure they win with the ‘official payments made for stray animal control’. If they read this and say we are overstepping the plate, then let them come forward and threaten to take us to court if they think we are telling untruths. We have THE EVIDENCE; know the shelter formats (ask those campaigning for the Pozega dogs) AND HAVE THE SPECIALISTS WHO WILL TESTIFY THAT THE STERILISATION OF STRAYS IS THE ONLY WAY TO REDUCE NUMBERS OVER A GIVEN TIME PERIOD. At the same time we can also inform that we and others have been ignored by the EU when it comes to a strategy for stray animal management. We have said a lot about this and gained a lot of evidence over the last 11+ years. Never have we so far even been threatened with court action – we wonder why ? – could it be that we are correct and the government attitude to long term stray management and associated finances is wrong ? So the situation is that Serbia does not sterilise stray animals as it prefers a money making ‘kill’ policy. Sterilisation would reduce stray numbers = less animals to catch and kill = less money into pockets for some. But also a win – win situation for stray number reduction. Like live export evidence presented to them, the EU does not really care; it just chugs on at a pathetic rate ignoring any non compliance evidences with its own-created Regulations such as 1/2005; whist at the same time preaching to all other member states that the UK was so wrong to vote to leave the EU. I am a ‘European’ from the UK; and thus would accept to be IN the EU, but only if the EU actually enforces its own rules, which it does not. The UK will not put up with the EU shambles; so we voted to get out. 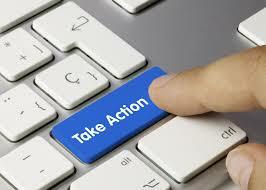 Does the Le Pen situation in France on 23/4 not tell them (EU) that most people in Europe; the normal citizens; are fed up with deaf ear ‘EU jobsworths’ who really do nothing but type out Europa websites and non-enforceable EU regulations each and every day ? 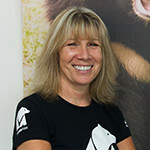 Regardless, I have massive respect and love for Jill Robinson and the work she has undertaken at Animals Asia – it is now a world wide organisation which is slowly but surely killing off the bear bile trade and opening the cage doors to a life of freedom and love and care for all the bears they rescue. Soon there will be no more bile farms – Jill will have succeeded in bringing her dream into the real world; and for that she deserves all of our respect and admiration. She is one very special lady. It is because of such very special people like her, that SAV will always promote and support the work of this excellent organisation – Animals Asia and their founder, Jill. It really makes you wonder if these kind of jerks should even be allowed within 100 metres of an animal – let alone own them ! Allegedly sawing off the leg of his horse without any kind of anesthesia or sedation ! Demand that this person be punished for his actions which left the horse in question dead.